CITT Alberta has invited Figure 53 to Alberta for 3-days of QLab 4 training in Edmonton! What is Figure 53? They are the awesome folks who created and support QLab. They are sending two of their best trainers from Baltimore to Edmonton to teach all of you! Are you a designer? A programmer? An artist with a one person show? Come learn how to make your shows easier and more predictable with exciting techniques and concepts using QLab. QLab runs shows of all sizes, all over the world. From intimate theatres, touring Fringe shows, Broadway and to televised events reaching billions of people across the globe, QLab is the tool designers trust to make their live shows come to life. Flexible, reliable, and easy to learn, QLab is the industry standard for a reason. QLab makes it simple to create intricate designs of light, sound, and video, which you play back during a live performance. QLab allows you to lock in exactly how you want the light, sound, and video to play during your performance. When you’re done designing, you’ll switch to “show mode” and run your show just by pressing “GO”. Day One will cover an introduction to QLab, the basics of getting around and getting things done, some discussion of MIDI and Open Sound Control, and then focus primarily on Audio. You will learn about playback rate control, looping audio, plugins and basic system tuning using only QLab. Day Two will focus on Video and continue on MIDI and OSC, as well as some deeper discussion of workflow. You will learn how to use single-screen projection surfaces and practice blending multi-screen outputs. Time will be spent using mesh warping, projection animations and video effects. Day Three will focus on Lighting, creating instrument definitions, patching and cueing you show. Then move on to advanced scripting, and continue the discussion on workflow. All days will involve a lot of Q&A, so bring your questions! The class works best when it moves in a direction guided by the students, not the teachers. Students are encouraged to bring a Mac laptop in order to better follow along. It isn’t required but will be very helpful. Please check here to see the recommended system specs for running QLab. Each attendee will get a fully functioning demo copy of QLab for a week. Course will be held in Allard Hall on MacEwan University’s campus near downtown Edmonton. 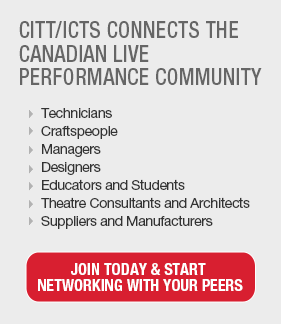 We encourage you to sign-up for CITT/ICTS membership and then register at the reduced rate. Registering will also give you access to discounts on future training opportunities. Sam Kusnetz is a sound designer, composer, projections designer, production manager, and all-around theatrical problem solver working in and around New York City, as well as across the nation. He holds a B.A. in Theatre from Brown University and is a proud member of United Scenic Artists, the trade union which represents designers and scenic artists. His friendship with QLab began before version 1, and he’s happy to report that he’s never looked at another MiniDisc since. Allison Clendaniel is an interdisciplinary artist living in Baltimore, MD. Her work encompasses sound, extended vocal technique, technology, and theatre. She has studied voice and movement with legendary performer and composer, Meredith Monk at the House Foundation. An avid advocate for the arts, she is Co-Artistic Director of Mind on Fire, a modular chamber orchestra, and co-founder of Feral Woman, a theatre troupe in Baltimore, MD. Add Alberta Section - Official QLab 4 Training Event with Figure 53 to my calendar.